These were only a few of the many questions and thoughts that raced through my head as I awoke to slew of text messages and social media posts on Sunday, June 12, 2016 regarding the tragedy in Orlando. Unfortunately, this was not the first time I had experienced similar emotions, but an experience that would forever impact the way I thought about my work. The Orlando shootings had not only taken the life of a friend I had made from my days as a young 20-something living in Atlanta, Georgia, but had also ended the lives of 48 other innocent people, who left behind droves of loved ones and strangers trying to make sense of why such a senseless and heinous act of hate and violence occurred. I can’t describe the level of personal pain and reflection I went through during the days following. As a cis-gendered gay man who has struggled (and still struggles) to accept and embody my own sexuality, the occurrences in Orlando were all too real and all too close to home. Although I was numb with pain, and spiraling with questions, as a person who has dedicated his life to fostering more inclusive and culturally affirming communities, I quickly thought about my work as a student affairs scholar-practitioner. I would once again have to go to campus and engage in emotionally charged dialogue about how to support students as they processed and came to grips with this new reality. Lo and behold, I was right. Over the next few days, I would sit in a room with a number of dedicated and often compassionate colleagues to discuss best practices, campus communications, counseling services, candlelight vigils, educational programs, reflective prompts, community dialogues, conflict resolution tactics, intercultural competency trainings and numerous other approaches to supporting our students. This act of violence would cause dissonance and shape this generation’s understanding of hate towards same gender loving people. I wondered, how many times would I have to respond to trauma, while I was in trauma myself? How many times would I have to lead efforts to create more awareness, more comfort, more inclusive environments, while I personally dealt with emotional, psychological, and even psychological turmoil? As someone who identifies with multiple “culturally rich” identity groups, I am often at the center of the pain digested and the solution. How do you navigate and encourage hope, when your own heart exists in despair? That’s something I have had to ask myself all too often over the past few years. From Oscar, to Rekia, to Trayvon, to Eric, to Freddie, to Sandra, to Tamir, to Jonathan, and now to Alton and Philando. This list only represents the handful of brothers and sisters I can recall off the top of my head that have experienced the ultimate outcome of White supremacy (i.e. systemic oppression). Now to grapple with the loss of 49 LGBTQ people of color, only made the realities of this world more salient, yet increasing challenging. As I juxtaposed my commitment with social justice and my lived experiences fighting for freedom, I wondered if I, and other professionals, have been doing students a disservice over time. See, it’s not that I disagree with any of the aforementioned foundational “best” practices. But this particular horrific tragedy made me realize that although we as well-intended and capable higher education professionals work hard to create affirming safe spaces for students, we cannot shield them from the unsafe realities of the world. Students navigate their lives and negotiate their identities within and between the margins of our campus communities and the harsh realities of our hate stricken world. 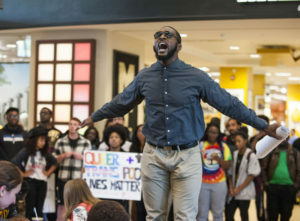 Although we do our best to create a sense of belonging and connection for students, they must still grapple with life truths of hate that form patterns of oppression and foundational systems of identity-based privilege. We can continue to work tirelessly to create physically safe spaces through trainings and intentional community building interventions, but how do we create safe mental spaces? How do we create psychological spaces where students can truly thrive and navigate their college experience free of undue internal stress or constant reminders of devalue? How can we continue to expect students to achieve so many of the intended learning and developmental outcomes we tout as integral, while they consistently experience high levels of mental incongruence and dissonance? If we are to stay true to our purpose and mission of creating fair, equitable and affirming safe spaces for students to truly reach their full lived potential, we must begin to think deeper about the context and constructs involved in creating these safe spaces. Campuses need to invest in rewriting policies, procedures and practices that consider the unsafe psychological spaces that our students often experience. Although processing, reflecting, dialogue and meaning making are great ways to foster value development and understanding, they do not make up for the internalized destruction that many students grapple with on a daily basis. I love this profession, and I am committed to continuing this work, but we need to reconsider safety in its truest and most innocent form. A safe physical space is nothing if your mind is warped with constant harm. Dr. Jamie Riley has worked in student affairs as an educator and/or practitioner for over a decade, working in multicultural affairs, residence life, student activities and assessment and evaluation. As a researcher, he has investigated the role of racism and race in impacting campus climates and students’ ability to successfully navigate and engage within campus environments. Dr. Riley currently serves as the Associate Dean for Diversity & Inclusion at Johns Hopkins University in Baltimore, MD.